IQS Directory is a top industrial directory listing of leading industrial heat sensor manufacturers and suppliers. Access our comprehensive index to review and source heat sensor manufacturers with preview ads and detailed product descriptions. These heat sensor companies can design, engineer and manufacture heat sensors to your specifications and application needs. A quick and easy to use request for quote form is provided for you to contact these heat sensor manufacturers and suppliers. Each company has detailed profile information, locations, phone number, website links, product videos and product information defined. Read customer reviews and product specific news articles. We are the right resource for your information requirement whether it's for a manufacturer of temperature sensors, RTD sensors, or thermocouple wire. In business since 1972, Thermo Sensors Corporation is a leading heat sensor manufacturer and offers an array of other products and services. Thermo Sensors provides the chemical, petrochemical, refining, food, pharmaceutical and other industries with options of standard & special designs. We are dedicated to our extensive quality control program which truly makes us an innovator in the heat sensor industry. Thermal Devices is your source distributor for industrial heat sensors and many other temperature handling equipment and products. We are determined to provide you with a positive shopping experience, including excellent customer service, quality products, affordable pricing and speedy delivery. Turn to Thermocouple Technology, LLC for outstanding heat sensors. These high performance heat sensors are made for accurate temperature measurement and control. 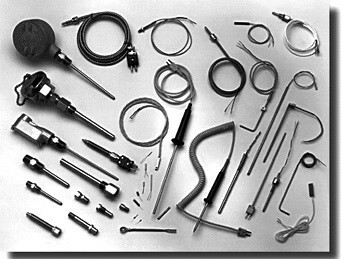 We are your source for a wide range of thermocouples, RTDs, thermowells, thermocouple wire, transmitters, indicators, and more! Give us a call today to learn more information about our company! 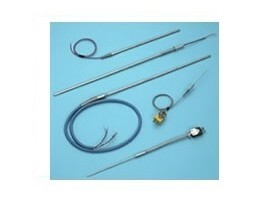 Temperature Specialists, Inc. is a custom manufacturer for all your thermocouple and heat sensing needs. RoHS compliant, we strive to provide our customers with the best user experience possible. We can manufacture in any size and resistance values, and can match special resistance curves as well. Quality is truly at the heart of our manufacturing process. Backer Hotwatt manufactures a complete line of electric heating elements for a wide range of uses. We offer a broad product line of cartridge heating elements, tubular heating elements and immersion heating elements. We have been manufacturing heating elements in the USA for over 60 years. Transducers are a type of device that converts varying physical quantities into electrical signals, or vise versa. Or, in other words, transducers are devices that convert one form of energy into another. The varying quantities that they can convert include things like brightness, pressure, position, energy, torque, force, position, motion and heat. Of the many types of transducers manufactured, this article will be taking a closer look at heat transducers, more commonly known as heat sensors. Heat sensors are transducers that generate and use an electrical signals to communicate rates of heat change, which operators use to calculate heat flux. (Heat flux is the rate per unit time at which heat energy is able to reach and pass through a surface.) Heat sensors are implemented in the estimation of fouling on the surface of a boiler, the study of the influence of flames and fire on a surface and other observational applications that work to increase process efficiency and/or human safety. Examples of commonly used heat sensors include: resistance thermometers, thermocouples, thermistors and silicon bandgap temperature sensors. Of all heat sensors, or temperature sensors, the four most common types of heat sensors are semiconductor based sensors, resistance temperature detectors (RTDs), thermocouples and negative temperature coefficient (NTC) thermistors. Semiconductor based sensors, used with integrated circuits (ICs), function, for all intents and purposes, as two identical diodes with heat sensitive voltage versus current characteristics. These characteristics allow them to semi-accurately monitor temperature variations. RTDs, or resistance thermometers, consist either of a film or a wire wrapped around a glass or ceramic core. They are highly accurate and measure heat by comparing the resistance of the RTD element against temperature. Thermocouples are made up of two wires, each composed of a different metal, connected at two points. Proportional temperature changes are reflected in the varying voltages of the two connection points. They are incredibly accurate, but quite expensive. Finally, NTC thermistors are thermally sensitive resistors that display predictable resistance changes that relate to temperature changes on a large scale. They exhibit high levels of accuracy. Most often, heat sensors are used for applications in the fields of medical study, agriculture, meteorology and building construction. In medical studies, heat sensors are used to determine and measure the exchange of heat inside a human body. More plainly, they measure temperature in the human body. In addition to helping individual patients on a case to case basis, heat sensors can measure overall average human body heat exchanges. Information such as this is useful beyond the medical field; it can be used in the textile industry to create properly insulated clothing and sleeping bags, as well as immersion suits. In agriculture, heat sensors are buried in soil of fields to measure heat flux over time. When the information the sensors have recorded is gathered, sensor operators can ascertain with a fair amount of certainty the amount of energy that can be stored in that soil over a corresponding period of time. Next, in meteorology, they help accurately measure heat and help forecast future temperature changes. When used in building construction, heat sensors are placed inside to help builders determine whether or not the walls they have built have yet been well enough insulated. Furthermore, heat sensors can be used to detect and notify people of possible fires. Heat detectors, not to be confused with smoke detectors, sound an alarm in the case of one of two situations. First, some are programmed to sound when temperatures spike suddenly, warning of a fast-growing explosion or fire. Second, others are designed to sound an alarm when surrounding temperatures reach a certain threshold. The latter works when a metal component on the sensor, designed to melt at a certain temperature, melts and triggers the alarm. These type of heat sensors are called rate-of-rise heat detectors and fixed-temperature heat detectors, respectively. Heat sensors can work in the home, as common thermostats, or in the laboratory, as more complex and precise devices used for scientific research. Typically they work either as contact sensors or non-contact sensors. Contact sensors are those sensors that measure their own internal temperatures after they have matched the heat around them, or have achieved thermal equilibrium. Non-contact sensors, on the other hand, measure the heat radiation of the area around them, like agricultural sensors do. In addition, while some heat sensor systems must be checked on-site, many, like remote sensor thermostats, may be operated from afar. Heat sensor systems can also sometimes be improved upon with computerized programming. Unfortunately, heat sensors almost always function with a margin of error, which widens or narrows depending on the sensitivity of an individual device. However, their benefits far outweigh their shortcomings. They make all the difference between a properly functioning system and, sometimes, life or death. To find out more, contact a reputable sensor engineer. Heat Sensors – Temperature Specialists, Inc.